The history of the publication of one of the most influential children’s books ever written was not straightforward. Charles Dodgson (Lewis Carroll’s real name) told the story to Alice and her sisters on a boat trip on July 4th 1862. Alice loved it and begged him to write it down, so over the following months he laboriously copied it out for her, adding his own scratchy drawings. Because of his day job – Mathematics Tutor at Christ Church College – and his other engagements, he did not get around to giving it to Alice for another two years. In the meantime the MacDonald family’s children saw the manuscript, then called Alice’s Adventures Underground, and urged Mr Dodgson to publish. So he expanded the story, adding the Mad Tea Party and the Cheshire Cat and turning the croquet mallets from ostriches into flamingos. Then he approached Tenniel to illustrate the book, a great coup for him at the time as Tenniel was a well-known illustrator for Punch. 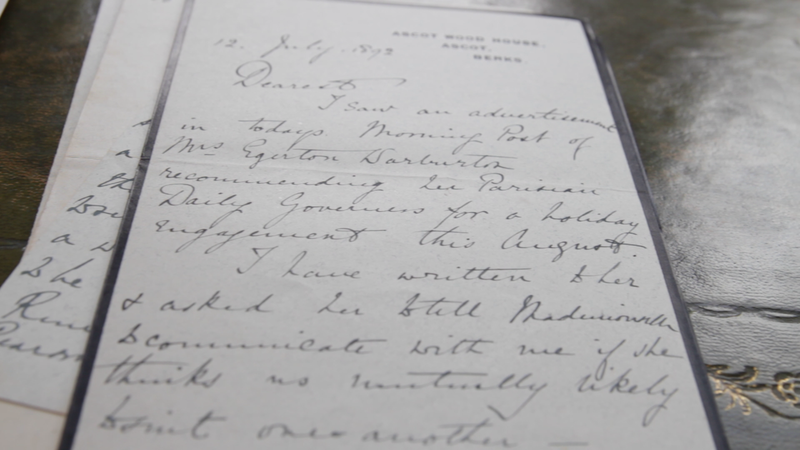 After Dodgson had signed a contract with Macmillan publishers, he published the first set on books on July 4th 1865, exactly three years after the boat trip. But Tenniel was dissatisfied with the printing quality of the pictures, so they were recalled. The second “first edition” was printed in November – 150 years ago this month. 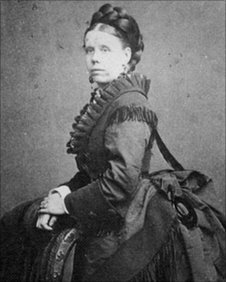 But as well as her photograph, there were other facts that I found out about her in the course of my research. She was very likely the inspiration for the Red Queen in Through the Looking Glass. 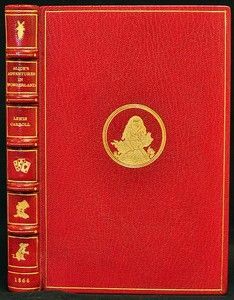 Lewis Carroll said the Red Queen was, “the concentrated essence of all governesses.” He also said she is “the thorny kind,” an allusion to the Liddell’s girls’ nickname for Prickett, “Pricks.” The name is a gift for a novelist! 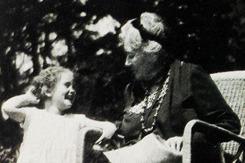 Alice recalled later that her governess was “not the highly educated governess of today.” Mary Prickett was employed to ferry the girls about and to teach them basic reading and writing. For art lessons the girls had John Ruskin; they also had tutors for French and music and other accomplishments. Academic achievements were a low priority for girls and Mary’s task was not onerous. In adulthood Alice wrote to her sister Ina that she had not been Mary’s favourite. The governess had preferred Ina, the “good” girl. 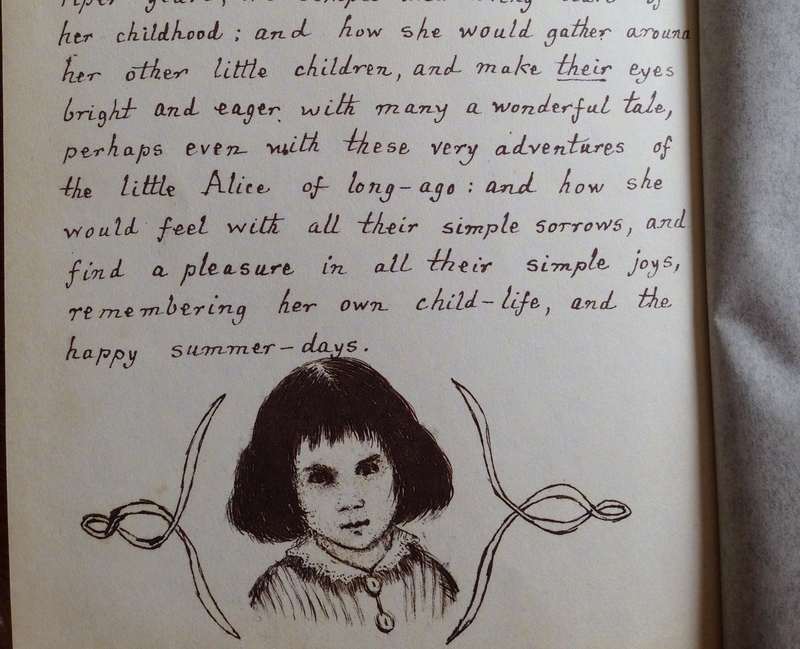 It was easy for me to go on to create Alice as the kind of girl you wouldn’t want at your kid’s birthday party – charming to some, unbearable to others (especially governesses). And most importantly, there was a rumour in Oxford that Lewis Carroll came so often to the Liddells’ house because he was paying court to the governess – and that formed the main plot of my book. Governesses are good narrators because they float between adult and children’s worlds, seeing everything and belonging nowhere. Mary is lonely and desperate to have a life of her own, and when she meets Lewis Carroll she thinks he will be the person to give her that life. She’s wrong of course – but I’m not going to give the plot away! The power of Alice in Wonderland, 150 years on. This month hundreds of people congregated in Oxford to celebrate Alice Day, as they do every year. Although this year, the 150th anniversary of the book, was bigger than ever: 150 Alices, a lobster quadrille, a mad tea party and chapters being brought to life all over the city. Why does Alice endure when so many have faded? 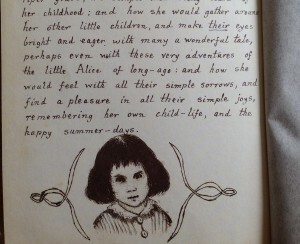 Alice is the first heroine in children’s literature with interiority. We can identify with her as she struggles to communicate with the mad creatures she meets. Alice is essentially a coming of age story. As she grows and shrinks and tries to make sense of the world. And who hasn’t felt like her? Like a child adrift in a world of crazy adults. Alice’s Adventures in Wonderland transmogrifies itself for every era. It adapted to the acid taking 60s, the psychoanalytical movement and still looks fresh in the steampunk moment of now. Alice has leapt free from the bounds of her covers. We are all Alice now: you can’t open a paper without someone having “gone down the rabbit hole” or stepped “through the looking glass.” The book is said to be the third most quoted in the English language, after the Bible and Shakespeare. And I, who notice whenever Alice is mentioned, can easily believe it. I love this picture of Alice and my mother. My mother is just three and she looks so happy twirling around on Alice’s knee. My mother was Alice’s only granddaughter: Alice’s other two sons died in WW1, leaving only Caryl. Caryl married late and had only one daughter – my mother. Alice loved having her to stay. Her letters talk of “the child” in glowing terms and Alice spoiled her by having her up on her knee and feeding her sugar. My mother remembers an old lady in black whose chickens she chased into bushes. But Alice disapproved of Caryl’s wife: she was a widow with two grown-up children. Alice thought she should not have married again. And she was jealous – by this time Alice was a widow too and Caryl had looked after her for years. My mother remembers him choosing her a Rolls Royce for the massive sum of £500! Alice was not keen to let him go to the arms of another woman. So Caryl didn’t bring my mother to see Alice as often as he would have otherwise. All of which made her visits sweeter. 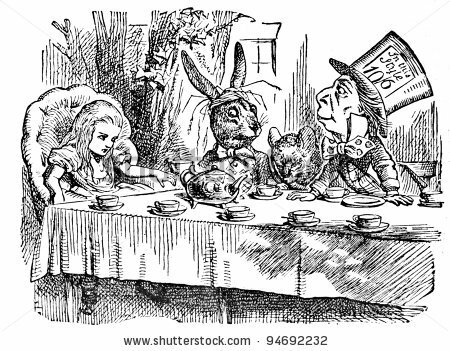 A great deal of what would become Alice in Wonderland was told in one creative burst on the instigation of Alice Liddell on the river one summer afternoon more than 150 years ago. Alice pestered Lewis Carroll to write her story down. He took more than two years, but eventually, in 1864, he presented it to her for an early Christmas present. It was something she treasured all her life. My mother remembers her father Caryl (Alice’s youngest son) telling her that this priceless piece of children’s literature was kept in the anteroom of Cuffnells, the house they lived in, for anyone to have a look. 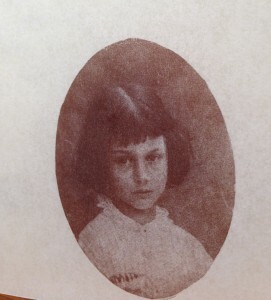 Not at all like the real little Alice Liddell. He grew so disconsolate that he gave up and stuck a photograph of the beautiful little girl that he loved over the top. The original drawing wasn’t discovered until 1977. Now, in the printed version of the manuscript once owned by Alice, the photograph is attached by a flap so that the drawing underneath can be seen. It reminds me of Wonderland: go deeper down the rabbit hole and you will discover the truth. And by the by you will also discover that there is no truth to discover! 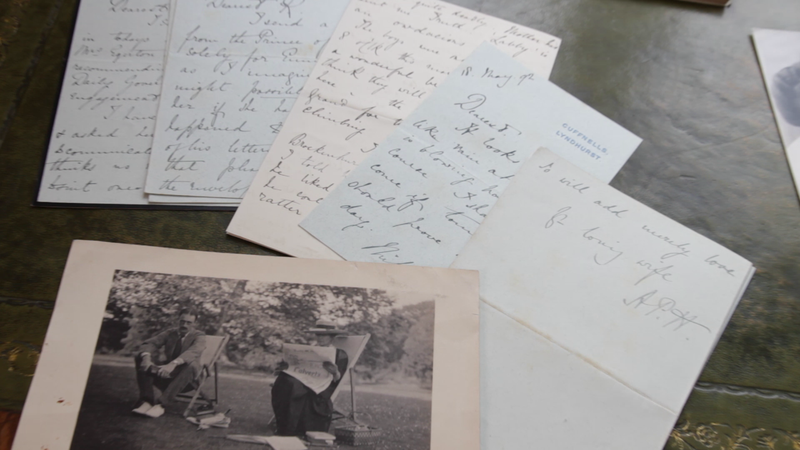 Now that The Looking Glass House is approaching publication, I’ve been looking out some of Alice’s letters and photographs. The letters in this picture are written are written to her husband Reggie Hargreaves, and this photograph, which I love, is of Alice and her son Alan. Alice looks very grand and rather put out by having a camera – once again – trained on her. So much so that she wouldn’t even look up from her copy of The Times! So different from when she was Lewis Carroll’s muse, alluringly gazing out at us. But, to me, it is easy to equate the heroine of Alice in Wonderland with this strict, grand old lady. In the book which she inspired, Alice is precocious, inquisitive and, at times, pretty rude. Not such a huge jump, some 60 years later, to an old lady whose childhood characteristics had ossified into something harder. My mother (Alice’s granddaughter) remembers sitting on her knee and receiving sweets. Perhaps, like all of us, she wasn’t just one person but many. She was after all, two people in her own lifetime – fictional Alice bestriding the world as a seven year old girl, and real Alice who lived an obscure gentlewoman’s life in the New Forest. 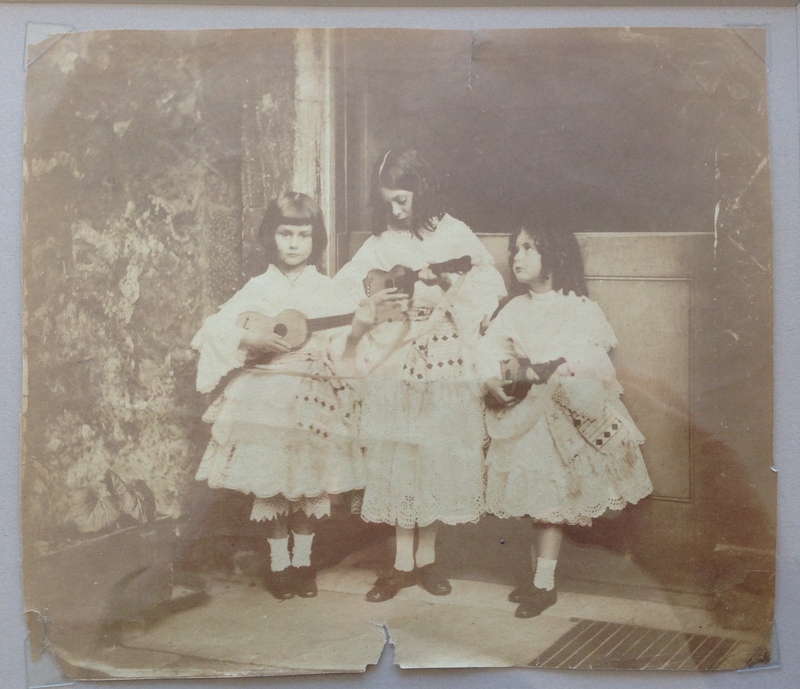 When our family sold Alice’s memorabilia more than 10 years ago, one thing I managed to hold on to was this original photograph of Alice and her sisters playing the ukelele, taken by Lewis Carroll. 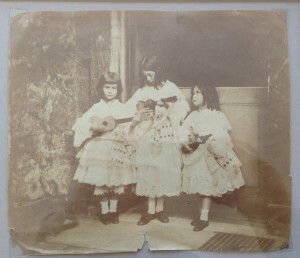 Lewis Carroll, or Charles Dodgson as he was really called, took loads of photographs of the girls, Alice in particular. In fact he was an early pioneer of photography and he used the collodian wetplate process, a fiddly business with lots of variables: if the chemicals were mixed wrongly, the exposure too long or too short, the light to bright or too dark, and so on, the plate would be ruined. 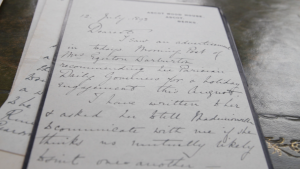 Dodgson’s diaries are punctuated with failures. And also the children had to sit completely still for up to a minute! He often told them stories to get them into the dreamy state of mind he wanted. And there are lots more parallels between photography and Alice in Wonderland: the glass negative turned black into white, like all the inversions in his tale. The lens created little miniature upside-down figures. And his photographs often tell a story, or suggest one, rather than being straight portraits.